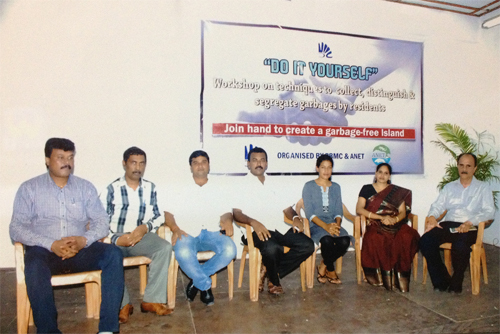 Port Blair, May 7: A workshop was organised by the PBMC in collaboration with ANET for the Sanitary Supervisory Staff of the Council on 4th May 2013 at the Delanipur Community Hall wherein techniques to distinguish wet/ dry waste and encourage residents to take up segregation at source was taught. Shri P.B. Murugan, Chairperson PBMC, the chief guest on the occasion stressed on the importance of systematic solid waste management system with the support of public cooperation. He also advised the public, not to throw garbage on the streets and nallahs and to keep their surroundings clean. Smti Jameela Bibi, Chairperson, Public Health & Sanitation, Shri Inter Pal Singh, Ward Councillor also attended the workshop apart from the officials of PBMC. On the occasion, a multi-media presentation on “Segregation of waste at source” was presented by Miss. Tasneem Khan, Assistant Director, ANET. Through her presentation, Miss Khan educated the sanitary supervisory staff on how to collect, distinguish and segregate garbage by spreading awareness among the residents. Sr. Scientist of ANPCC, Dr. Rishikesh spoke on the management of solid waste and plastic waste in a most acceptable manner. On the occasion, Shri Inder Pal Singh, Councillor of the ward proposed the vote of thanks.